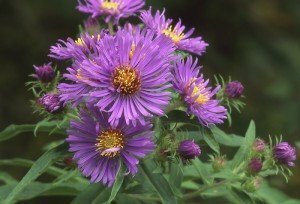 Asters are a hardy, easy-to-grow and colorful group of fall-blooming perennials. New England asters are tall perennials that not only are hardy and low maintenance, but also provide vibrant displays of reds, pinks, purples and white in the fall. At a time when most other perennials have finished blooming, asters provide needed flowers for bees, butterflies, and other pollinators. They combine well with ornamental grasses, rudbeckia, and coneflowers. Although this species of aster is termed “New England”, it is native to most areas of the eastern U.S., except some southern states. It is hardy in U.S.D.A zones 4 (minimum temperatures in the -20’s in winter) to 8. You can find it planted and growing well even in many western states. Plants generally grow 4 to 6 feet tall, but can be lower, and 3 to 4 feet wide. In the wild, New England aster is typically found in areas with moist soils, although many have escaped from gardens and naturalized in fields and along roads. It will tolerate clay soils, and some drought once established. Growing in moist soils makes this plant a good candidate for rain gardens, in addition to borders and naturalistic gardens. New England aster really needs full sun (6 or more hours a day of direct sun) to grow and bloom well. Depending on area, blooms begin in August or September (usual in the north), last for several weeks, and colors vary with the cultivar (cultivated variety). If you want to have even later blooms on some plants or prolong the bloom season, cut some plants back in June by about one-half to one-third. This will make them bushy, shorter, and bloom several weeks later. There are few serious pests or problems on New England asters. They can get a rust disease, with small rust-colored raised spots on leaves. In some areas, some cultivars may get a white powdery mildew on leaves. Both of these are mostly an aesthetic disease, and plants should grow and bloom yearly in spite of such problems. Although various common pests may be found on New England asters, as with the diseases, seldom if ever are these a serious problem. Two of the more common, that cause pale leaves with a stippled appearance, are spider mites and lace bugs. Since New England asters are vigorous growers, some cultivars may need staking. This is particularly the case in rich soils that cause abundant growth, or in part shade. For such plants and conditions, pruning plants back in June as noted for the later blooms will keep them stockier with no need to stake. Especially in areas with longer growing seasons, you may need to cut off spent flower heads after bloom to prevent them from forming seeds that self-sow, if this could be a problem in managed landscapes. If plants have fewer blooms and open centers after a few years, they may need dividing in the spring. You can either divide the plant in half, or pieces off from the original with a spade; or dig the whole plant, divide it into sections (an old pruning saw or hatchet work well), and replant. New England aster is in the aster or composite family— Asteraceae— that of sunflowers, daisies, and similar flowers. The asters all used to be grouped together into one “genus” (Aster), but thanks to recent botanical research they’ve been regrouped with names more suited to botanists than gardeners. So, although the New England aster genus is now changed (Symphyotrichum), the species name has remained the same (novae-angliae). This species of aster was introduced to England in 1710, and over the years cultivars have been bred there and in Europe, and reintroduced here. Since it and the related New York aster bloom in England around the time of St. Michaelmas day (September 29), these may be seen in some references and catalogs as Michaelmas daisies. In perennial trials at the Chicago Botanic Gardens, 119 asters were evaluated over six years. This evaluation included many other aster species and cultivars beside just those of the New England aster, of which there were 12 cultivars in addition to the native species. Although none of the New England asters were among the few excellent rated asters in the Chicago trials, two popular pink cultivars rated good, with four stars. ‘Harrington’s Pink’ has rosy-pink flowers mid-season from early September to mid October. It, and other cultivars mentioned, unless noted otherwise, had excellent flowering. In these trials, ‘Harrington’s Pink’ reached about 5 feet high and about 4 feet wide. It had fair resistance to powdery mildew and excellent resistance to rust, as did the following unless noted otherwise. The other top cultivar of New England aster was ‘Honeysong Pink’, with deep pink flowers the same time as ‘Harrington’s Pink’. It was about the same height, but under 4 feet wide. Another popular pink cultivar, ‘Alma Potschke’ with it’s cherry-pink flowers, rated fair with three starts. In Chicago it has a long bloom period, from early August to late October. Only reaching about 3 feet high, it spread about 5 feet wide. For a white cultivar, you might consider the popular ‘Wedding Lace’. Rating fair, it had a long bloom period similar to ‘Alma Potschke’, and excellent rust resistance but poor powdery mildew resistance. It reached a bit over 5 feet high, and a little under 5 feet wide. There were 3 purple cultivars in the Chicago trials that rated fair. The native species grew a bit over 5 feet high, and 5 feet wide, blooming late—from late September to mid-November. ‘Mrs. S.T. Wright’ had only good, not excellent, flowering and poor powdery mildew resistance. It bloomed over a long period similar to ‘Alma Potschke’, only reaching about 4 feet high and wide. ‘Treasure’ had a similar bloom period to the latter, but reached about 5 feet high and about 3 feet wide. It, too, had poor powdery mildew resistance. One of the more recent introductions has been ‘Purple Dome’, from the Mt. Cuba Center and gardens in Delaware. It is a popular, violet-purple, low cultivar only growing to about 16 inches high and about 2 feet wide. This makes it a good choice for fronts of borders, along walks, massed, or even containers. It bloomed over two months in Chicago, from early September to early November. ‘Vibrant Dome’ is a bright pink sport of this compact cultivar, not in these trials but popular and available. A popular purple-blue cultivar that rated fair was ‘Barr’s Blue’. It has mid-season flowering, reaching a little under 5 feet high with wider spread. ‘Hella Lacey’ is a popular cultivar with light violet-blue flowers, but it rated poor in the Chicago trials. There it bloomed late, had poor flowering, and very poor powdery mildew resistance. September Ruby or ‘Septemberrubin’ is purple-red, and was the only red cultivar in these trials. With only fair blooming mid-season, and reaching about 4 feet high and wide, it too had very poor powdery mildew resistance. More on the many other asters, including the similar but generally lower New York asters, as well as other perennial evaluations can be found in the reports from Richard Hawke and his Chicago Botanic Garden trials (www.chicagobotanic.org/research/plant_evaluation).